Let’s frame the challenge in two dimensions. One dimension is the quantitative breadth of opportunity. It deals with connections which can span mobile, fixed, satellite, Wi-Fi and a host of short-range technologies. The other dimension deals with moving up the value chain. To keep matters simple, let’s consider five possibilities as illustrated below. 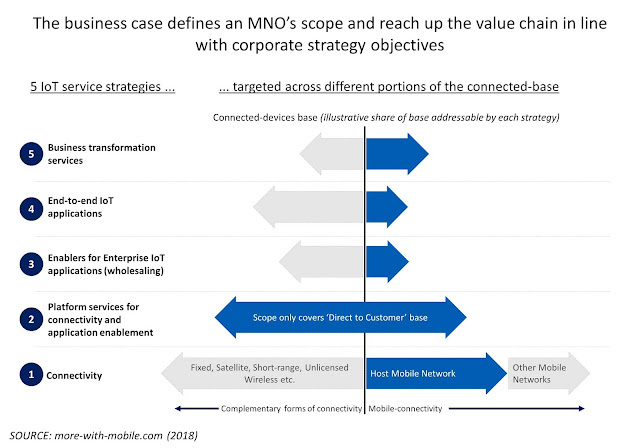 and, the extent to which the MNO contributes application-enabling solutions higher up the IoT value chain. In this multi-dimensional space, MNOs do not have to maximize the number of connected devices they manage. They can participate selectively in a few industry verticals or within large corporates where it makes sense to build deep business relationships. Let’s examine each of the five possibilities, moving up the value chain. Connectivity – MNOs tend to focus on connectivity tied to their SIM (and increasingly eSIM) offerings. A different perspective on the connectivity opportunity is to support applications that rely on a heterogenous population of devices (e.g. deployments in airports, cities, work environments etc.). These would naturally include devices on the host MNO’s network, from which the host would earn network access and connectivity fees. There will be applications that rely on devices that use a different MNO’s network and yet others that rely on other networking media (e.g. Bluetooth, Wi-Fi etc.). These connected devices would not contribute to the host MNO’s revenues. However, they would contribute value to the business relationship between the host MNO and the IoT application owner. CDP and AEP Platform Services – as the IoT has grown in scale and maturity, two platform categories have emerged. One is the connected device platform (CDP) which automates activities such as device provisioning and remote management (e.g. over the air updates). The second category is the application enablement platform (AEP). This helps users to manage application, device and sensor data for visualisation purposes and to develop the application logic that implements a set of business rules. Many MNOs rely on third party providers for CDP (e.g. Cisco/Jasper, Ericsson) and AEP (e.g. GE/Predix, PTC/ThingWorx etc.) capabilities. Depending on the structure of these platform service arrangements, MNOs can capture value by applying these capabilities across their connected device base. Enablers for Enterprise IoT – as enterprises have started to pursue IoT strategies they have begun to build new capabilities, often through acquisitions. Examples include PTC (ThingWorkx and other acquisitions), Altair (acquisition of Carriots), ENGIE (acquisition of Flashnet) and Rockwell ($1bn investment in PTC). The acquisition route is not open to all industrials especially medium and small-sized businesses. This points to an opportunity to sell IoT-enabling services to enterprise customers that seek to exercise control over their IoT deployments. In other words, there is an opportunity to offer in-house or third-party IoT service enablers on a wholesale basis directly to enterprise customers. Reliance Industries, including its Jio MNO unit, recently acquired Radisys to establish an IoT services portfolio and capabilities. As illustrated, the applicability of this type of offering will extend to a limited set of customers that represent a fraction of an MNO’s connected device base. End-to-end IoT Applications – There are application areas where MNOs may wish to offer end-to-end IoT applications to a limited set of customers. This means building on established capabilities and expertise in a vertical domain. Market examples include healthcare (e.g. Orange and Telus have dedicated healthcare businesses units) and telematics (e.g. Verizon and Vodafone have acquired firms to build their capabilities and distribution channels in the fleet and automotive sectors). Strategically, it requires an MNO to target enterprise customers directly, stepping beyond their supplier/enabler role in a B2B2B type of relationship. It also means generating revenues from a fraction of the total connected devices base. Business Transformation Services – MNOs have unrivalled experience of managing mobile devices and services on a large scale. This includes 24x7 back-office services, customer data management and the application of data analytics to manage large scale and highly distributed assets. As product companies transition to service companies and as others embrace digital strategies there is a role for MNOs to monetize their operational capabilities and experience through consultancy-like offerings. These five opportunities illustrate the range of possibilities for MNOs to target new markets created by the IoT phenomenon. It requires a shift in attitude from the uni-dimensional focus on connected devices and SIMs, low down in the IoT value chain. Instead, MNOs can take a bi-dimensional and multi-pronged approach. This begins by framing the opportunity in terms of complementary connected devices (mobile and non-mobile) and services along the IoT value chain. It is important for the MNO community to act on these types of opportunity to avoid further disintermediation. In addition to the proliferation of IoT platform providers, the competitive landscape is evolving in other parts of the mobile eco-system. Vendors such as Ericsson and Nokia , for example, are entering the fray, targeting MNO and enterprise customers directly. Ericsson’s CTO, Erik Ekudden, recently noted that his organization is looking beyond connectivity for the future of its business, with an eye toward helping others manage their IoT deployments . One other shift in perspective would also help IoT solution providers (and adopters) to make more of the IoT opportunity. It would require individual MNOs to reconsider the traditional boundaries of MNO-to-MNO rivalry and the merits of a different perspective on competition. This fresh perspective is based on the notion that enterprise users will be more confident about embracing MNO-enabled IoT solutions if they could buy a common, mobile offering for value-added IoT services. This would require MNOs to cooperate in defining an industry-wide standard for common services, building on past successes in streamlining the procurement and provisioning of M2M/IoT modules, for example. There’s a recent precedent for this kind of approach from the OTT service provider market. There, Facebook, Google, Microsoft and Twitter agreed to work towards a data portability platform for individuals to move their data easily between online service providers whenever they want . Could equally competitive MNOs reorient their strategic instincts to bring about such a change in the IoT market? Dis-intermediation risk for MNOs - here's an example involving Audi and Ericsson.